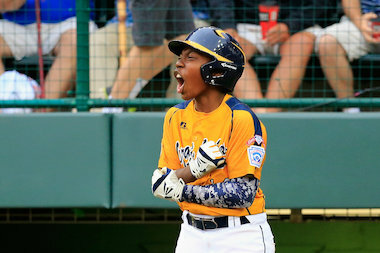 Brandon Green #14 of the Great Lakes Team from Chicago, Illinois celebrates after scoring a run in the fifth inning against the West Team from Las Vegas, Nevada during the United States Championship game of the Little League World Series at Lamade Stadium on August 23, 2014 in South Williamsport, Pennsylvania. CHICAGO — After the Jackie Robinson West kids won the U.S. Little League World Series crown on Saturday, a host of big-name stars sent their regards via social media. Here's who weighed in. US CHAMPIONS! WAY TO GO, #JRW! Let's hear it for Chicago! Congrats for victory today over a very good Las Vegas team at #LLWS2014. Good luck tmrw in championship game.